CMHA suggests that some of the best ways to deal with added stress around the holiday season are common sense strategies. The key is to keep things simple, focus on what is important to you and, most importantly, remember to make your mental health a priority. Plan ahead. If you’re entertaining, use the “keep it simple” strategy. Try menus you can make ahead of time or at least partially prepare and freeze. Decorate, cook, shop, or do whatever’s on your list in advance. Then you can really relax and enjoy visiting friends, relatives and coworkers. Beware of overindulgence. Having a few too many glasses of egg nog can dampen your holiday spirit; alcohol can lift your mood but then drop you lower than before. Also, too many sweets will probably make you feel lethargic, tired. Eat well. Exercise regularly. Get a good night’s sleep. These are three ways to battle stress, winter blues, and even colds. Stay within budget. Finances are huge source of stress for many people. Try to eliminate the unnecessary and stay within your budget. A call, a visit or a note to tell someone how important they are to you can be as touching as and more meaningful than a gift. You can also enjoy free activities like walking or driving around to look at holiday decorations, going window shopping, or making your own decorations or presents. Online classifieds and swap events are great places to find inexpensive brand-new items, and excellent-condition used items (which is good for the environment too). Remember what the holiday season is about for you. Make that your priority. This season is really about sharing, loving and time spent with family and loved ones. Develop your own meaningful family traditions that don’t have to cost a lot of money. Also, remember not to take things too seriously. Fun or silly things to do, games or movies that make you laugh, playing with pets, and time alone or with a partner are all good ways to reduce stress. Use this time of year to help regain perspective; watching children can help remind us of the simple things that can bring us joy. Connect with your community. Attend diverse cultural events with family and friends. Help out at a local food bank or another community organization. Give to a charity like CMHA Kelowna that helps those in need, or donating on someone else’s behalf; you can donate at www.cmhakelowna.com/give-the-gift-of-support. Gift-giving made easier and less expensive. Try putting family members and partners’ names in a hat and buy one gift for the person you draw; this can help reduce expenses and refocus energies on thoughtfulness, creativity and truly personal gifts. Encourage children to make gifts for friends and relatives so the focus is on giving rather than buying. If you find that your list of gift recipients is becoming ever-growing, think of combined gifts for people who live in the same household. Or arrange a mystery gift swap by asking friends to each bring one wrapped ‘mystery gift,’ then draw names to decide who picks out a gift first. Don’t be afraid to try new traditions than the ones you grew up with. Learn stress-busting skills you can use year-round. 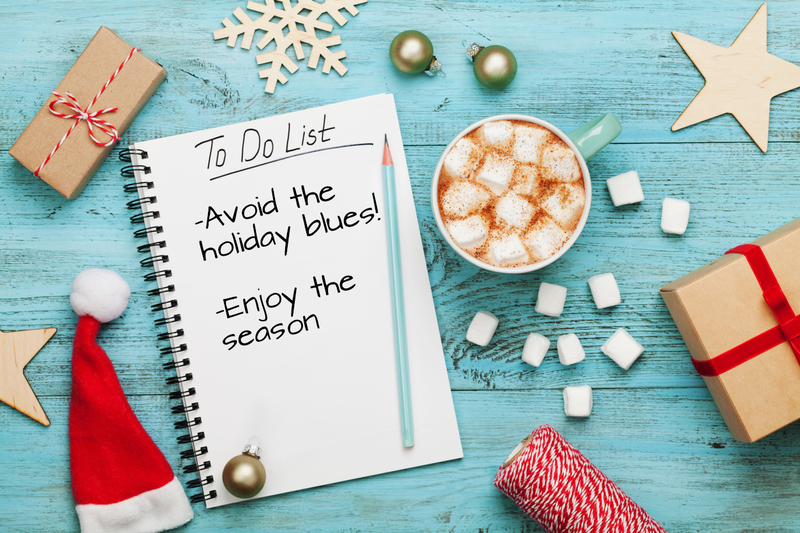 If the holidays often get you down, you may struggle with stress, low mood and worry at other times of year. CMHA’s Living Life to the Full (LLTTF) course can help you develop skills to better manage problems, practice healthy thinking, and build confidence. To learn more, visit our Workshops page. There are also fun and helpful booklets in the Living Life to the Full store to give your loved ones on—or after—the holidays. Talking about the deceased person is okay. Your stress will only increase if the deceased person’s memory is allowed to become a landmine that everyone tiptoes around. Things won’t be the same. It’s normal to feel at odds with yourself and family events when dealing with grief. Try not to hide away, but don’t feel guilty about setting limits on how many events you will attend. Don’t let other people’s expectations dictate how your holiday will unfold. If you don’t feel like doing something this holiday season, don’t let others force you. If you do want to attend holiday functions, make sure you know your limits. Leave early, arrive late, drive alone—do whatever you need to do to help yourself. Take care of yourself and seek support. Stress, depression and bodily neglect are not a great mix at any time of the year. Don’t forget to practice self-care and talk to your friends and family about how you feel. Also, many communities offer support groups for people who are grieving. Being around people who know what you’re going through can be very comforting. Think about building some new traditions. Remember that it’s okay not to do what you traditionally do. Planning something totally different is not an insult to the memory of a loved one, and can be a positive way to ease some of the pressure. That said, one of the traditions may include planning a special time to celebrate the memories of the person who died. Some families develop creative rituals like decorating a miniature Christmas tree at the cemetery, donating money to a charity like CMHA, singing their favourite seasonal song, reciting a special prayer before the evening meal, or even just lighting a candle. Symbolic gestures like these can help families validate their feelings of sadness and overcome the guilt of enjoying special occasions.